Best Gift? Best ski? Best Dressed? Best Car? Best drink? Click on a picture to see more. Savile Row may be seen as a staid, hide-bound bastion of masculine tradition. In fact, it’s a pretty lively place beneath that dignified exterior and attracts plenty of new recruits, male and female, both customers and practitioners. Latest addition to the list of those making fully bespoke suits is ‘40 Savile Row’, a company that arrived here some years ago dedicated to making fine shirts. 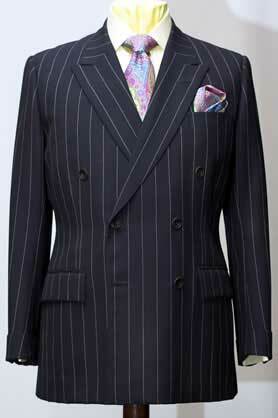 This chalk striped double breasted suit from Dege & Skinner is another example of the slightly 'Forties styling in favour - the sort of style chosen by classic film gangster of the period George Raft. Note the cuff details. Since then, the company has moved on to made-to-measure suits and now, to meet demand from customers and because owner Jeffrey Doltis has come to appreciate the quality of bespoke, it is launching a bespoke service. To do so, they have acquired the services of Adam Savvides, long time practitioner of the craft. Initially trained at the Tailor & Cutter Academy, under the revered Archie Whife, he has worked for various bespoke houses over the years, including Airey and Wheeler and Timothy Everest, and run his own business. Newcomer to the Row is Jasper Littman, a young man who acquired experience of the male clothing scene in a number of top retail houses in the area, before training stints at Gieves & Hawkes and Kilgour. Now, he has established a loyal band of customers, many within the City, who he will visit at their offices or homes, or he has facilities within Holland & Sherry's offices on the Row. “I will take measurements,” he says, but has the services of Savile Row-trained cutter and coatmaker for the actual making. “I take the cutter along to fittings.” Clearly, there are plenty of other young men out there keen to join the Row, as he receives applications each week from numbers eager to be taken on. New development at Anthony Hewitt will see managing director Ravi Tailor making bespoke suits for the young fashion retailer Revisu. This company took over the spacious shop premises at Number 9 that used to be Hewitt's, who have retained their workrooms and fitting facilities in the back. Cloth - Merchant help for tailors -Pick a pattern - What's in the sack? THE PEAKED lapel for single breasted suits in enjoying favour, according to a number of tailors. This shows some affinity with the move towards wider lapels, as seen in the ‘Forties style story we presented in the previous edition – though then, we were looking at double breasted suits. Ravi Tailor at Anthony Hewitt reports requests from customers for the peak detail in combination with a very slightly more shaped single breasted jacket. The extra width in the lapel of course helps emphasise the shape. At Richard Anderson, the pea jacket is enjoying a revival. Particularly interesting is the version made in a chalk striped formal cloth, with plain buttons – though most striking is the jacket in a brilliant orange. At Benson & Clegg, the recent introduction of a made-to-measure suit service has not only brought in new customers attracted by the more reasonable price level but has proved to be a means of gaining new bespoke customers too. "Once they have tried the made-to-measure service, we find that some customers then want to go on to try the full bespoke service," says managing director, Ken Austin. "So we are really quite busy. The City bonuses are also a bonus!"